Touted to be the world’s largest camel fair, the Pushkar Camel fair is an annual five day festival that takes place is the small town Pushkar in Rajasthan where livestock and camels are bought and sold. However, with recent years the fair has become more popular and is now a famous tourist attraction of Rajasthan. Apart from the trading of livestock, this fair is known for its colourful competitions and fun rides. The fair generally takes place in the month of either October or November from the Kartik ekadashi to Kartik Poornima. Both locals and tourists gather on the banks of the Pushkar Lake for five days. While men sell their cows, camel, goats and sheep women spend most of their time in the small stalls that sell clothes, fabric, jewellery and other accessories. Some reports even suggest that more than 100,000 people attended this fair is the 1900s. Some of the interesting competitions of this fair are "longest moustache", "matka phod", and "bridal competition". Pushkar is one of the five pilgrimages that is held sacred by the Hindus, the other four being Puri, Badrinath, Dwarka, and Rameswaram. According to Hindu mythology, the Pushkar Lake is one of the three places where lakes sprang up after petals from the lotus that Lord Brahma used to kill the demon Vajra Nabh fell down on Earth. As mentioned the festival takes place from the Kartik ekadashi to Kartik Poornima. Kartik Poornima is the main day of the five day fair as it is believed that it was on this day that Lord Brahma made the Pushkar Lake. On this last day of the fair, many devotees of Lord Brahma bathe in the Pushkar Lake as they believe that it a way of washing away their sins and taking the blessings of Lord Brahma. People of this town are mostly devotes of Lord Brahma and the lake is said to be surrounded by five hundred temples and fifty palaces. Obviously the Brahma temple is considered the most scared and during the fair devotees from all over the world come to pay homage and take blessings here as this is the only Brahma temple in India. 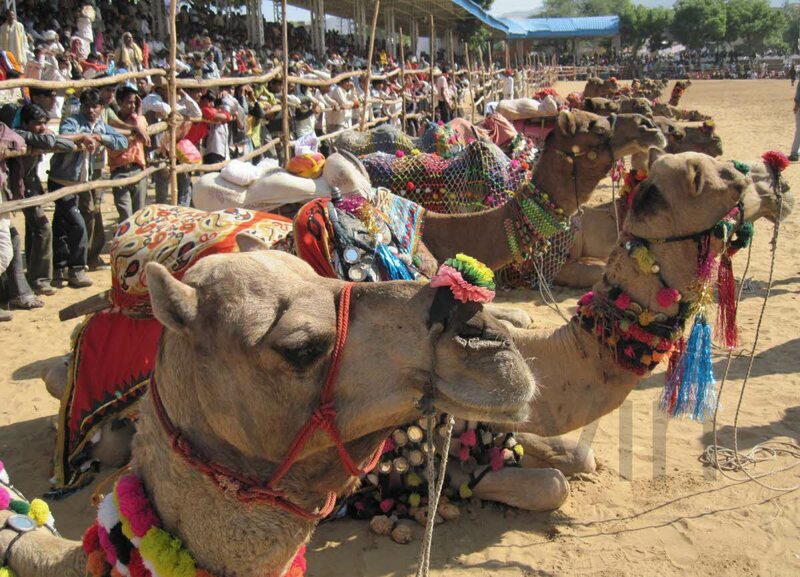 Traditionally, the fair begins with the camel race followed by music and dance. Most evenings include a cultural performance, performed by the locals of the town. Over the years, a cricket match between a team of locals and a random selection of foreign tourists has been added to the fair’s itinerary. Accommodation is not much of a problem as there are many options available to visitors. Many camps and hotels surround the event location and attractive packages are offered during that time of the year. People attending this festival should surely take time out to visit the other temples that surround the beautiful town of Puskar. A camel ride at the world’s largest and most famous camel fair is definitely in order and no one should miss that. Camel treks after the festival can also be arranged to explore the surrounding desert areas.